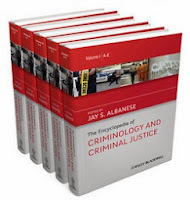 This is a copy of a publication in The Encyclopedia of Criminology and Criminal Justice, edited by Jay S. Albanese. Malden, MA: Wiley-Blackwell, 2014. Also available in pdf format. Also online from the publisher. Please cite as: Deflem, Mathieu, and Michael D. Bayer. 2014. “International Law Enforcement." Pp. 1168-1173 in The Encyclopedia of Criminology and Criminal Justice, edited by Jay S. Albanese. Malden, MA: Wiley-Blackwell. Organizations and practices of international law enforcement date back to at least the nineteenth- century consolidation of national states and have steadily expanded over the years in a myriad of forms and with a multitude of objectives. This entry reviews the history of international law enforcement, its basic contemporary forms and the main agencies involved, and its central objectives and value for contemporary criminal justice. International law enforcement refers to police actions that involve individuals or jurisdictions of more than one nation. With the increasing internationalization of crime, law enforcement has also been internationalized, a process that accelerated tremendously over the past decades, though its roots go back to the nineteenth century. There have been two distinct trends in the historical development of international law enforcement (Deflem 2002, 2005). First, the focus in international law enforcement has shifted from the policing of political dissidents, such as anarchists and socialists, to an almost exclusive focus on the enforcement of laws against criminal activities. The second trend has been a structural shift from unilateral operations conducted by national agencies on foreign soil to temporary and limited forms of cooperation between agencies from two or more nations, usually for specific investigations, and the development of organizations that encourage wide multilateral cooperation on a permanent basis. The central conditions for the internationalization of law enforcement have been the bureaucratization of police organizations and related advances in technology (Deflem 2002, 2005). Bureaucratization, as originally described by sociologist Max Weber, leads to institutional autonomy and increased professionalization amongst law enforcement organizations (Deflem 2002). As a result, law enforcement has historically become depoliticized to a great degree, enabling cooperation across national borders on the basis of shared professional standards of expertise. Advances in communication technology also facilitated the spread of crime across national borders and, independently thereof, propelled international law enforcement by facilitating information exchange amongst police agencies across national borders. The first effort to organize an international law enforcement organization occurred in 1851 with the formation of the Police Union of German States (Deflem 2002). This organization involved law enforcement agencies from seven German-speaking nations that shared similar political objectives to protect autocratic regimes. This cooperation dissolved in 1866 when war broke out between Prussia and Austria, the two main members of the Police Union. Similarly of a political nature was the 1898 International Conference of Rome for the Social Defense Against Anarchists. The Conference encouraged surveillance of anarchists and the exchange of information amongst participating law enforcement institutions, but the initiative was not effective because of sensitivities over national sovereignty. By the beginning of the twentieth century, there was a shift in international law enforcement toward criminal, rather than political concerns and, additionally, to have cooperation structured in a permanent organization (Deflem 2002). In 1914, for example, the government of Monaco initiated the first International Criminal Police Congress, which was explicitly restricted to addressing only criminal violations. However, the Congress was attended by legal and political officials only and failed to attract the participation of law enforcement officials. In 1922, an International Police Conference was held in New York City which was organized and attended by police officials, but it too did not produce any concrete results because there were no serious concerns over international crime in the United States at that time. In 1923, the geographic proximity of multiple nations in Europe contributed to the successful creation of the International Criminal Police Commission (ICPC), the forerunner of today's Interpol (Deflem 2002, 2009). The ICPC was independently organized by police officials in order to facilitate cooperation in the policing of international crime, while political violations were explicitly excluded. After the annexation of Austria by Germany in 1938, the ICPC was taken over by the Nazi regime, but after the end of World War II, in 1946, the organization was revived as the International Criminal Police Organization and has continued to exist until this day. International law enforcement through permanent multilateral organizations could only develop through the attainment of bureaucratic autonomy by law enforcement institutions (Deflem 2002, 2005). As a result, the law enforcement agencies participating in these international organizations could collaborate on the basis of a shared understanding of criminal enforcement goals. This criminal, apolitical orientation of international law enforcement organizations provides the basis for the collaboration of agencies from nations even with conflicting political or legal systems. Despite a growing cooperation trend amongst police, a national orientation persists amongst law enforcement, as manifested in three ways (Deflem 2002; Deflem and McDonough 2010). First, there is a preference amongst law enforcement agencies to conduct operations unilaterally without the involvement of foreign authorities. Second, cooperation between law enforcement agencies of different nations is most often conducted on a temporary basis rather than permanently structured through an organization. Third, in the context of permanent multilateral organizations, international law enforcement does not involve the creation of a supranational law enforcement agency, but instead provides a collaborative structure amongst police agencies from different nations. The international practice of law enforcement from the United States exemplifies the continuing relevance of nationality in international efforts (Nadelmann 1993; Deflem and McDonough 2010). American agencies are heavily involved in unilateral transnational law enforcement operations because of a historic lack of trust in foreign agencies and concerns about corruption and unprofessionalism. The United States has a dominant role in international police activities, which has been labeled the “Americanization” of international law enforcement (Nadelmann 1993). This dominance involves American law enforcement agencies being more active in international activities than any other nation's agencies in order to address concerns over the international drugs trade, illegal immigration and border control, and international terrorism. US law enforcement agencies with the greatest international impact and presence are the Federal Bureau of Investigation (FBI), the Drug Enforcement Agency (DEA), the Department of Homeland Security (DHS), and the Bureau of Diplomatic Security (DS) (Bayer 2005, 2010; Deflem 2010). The FBI conducts investigations for the Department of Justice and is responsible for policing federal crimes. It manages a system of attachés or legates, located in at least 52 countries, who participate in investigations and assist police in foreign countries to make arrests. The FBI also oversees international training programs for foreign police at its National Academy in Quantico, Virginia. The DEA is the US agency primarily responsible for policing the drugs trade, which includes many international activities at the border and abroad, such as communications with international organizations concerning drug control and a foreign liaison system. DHS is also thoroughly represented overseas, with 70 offices in 47 countries. Through their sub-agency, Immigration and Customs Enforcement (DHS-ICE), these offices are mandated with customs, immigration, and homeland security objectives. In the Department of State, DS is responsible for security of American diplomatic missions abroad and maintains the broadest law enforcement presence worldwide, with representation in embassies and consulates in 189 countries (Bayer 2010; Deflem 2010). Amongst its international responsibilities, DS investigates passport and visa fraud, carries out investigative requests from US federal, state, and local law enforcement, including fugitive apprehension, and investigates threats and acts of terrorism. DS runs the US Rewards for Justice Program, offering up to $25 million for information leading to the capture of international terrorists. DS also manages the Antiterrorism Assistance Program which trains foreign police in counter-terrorism measures. Another state department entity with an international law enforcement portfolio is the Bureau of International Narcotics and Law Enforcement Affairs. This bureau manages the International Law Enforcement Academy (ILEA) program in collaboration with a Steering Committee composed of representatives of federal law enforcement officers from selected agencies. There are four regional academies which are located in Bangkok, Thailand; Budapest, Hungary; San Salvador, El Salvador; and Gaborone, Botswana. The academies are led by in-residence senior US federal law enforcement officers and provide broad-based and specialized law enforcement courses to local and regional police organizations. At the level of international law enforcement cooperation, the most prominent organizations are Interpol and Europol. The International Criminal Police Organization (Interpol) is an international nongovernmental police organization that has member agencies from 186 nations (Anderson 1997; Deflem 2009, 2010). It operates out of a central headquarters located in Lyons, France, to coordinate information exchange through National Central Bureaus. For requests between member agencies, Interpol uses a color-coded notification system, with an additional special notice added for actions involving al-Qaeda or the Taliban. A nongovernmental organization, Interpol has observer status at the United Nations, in addition to cooperation agreements with Europol, the International Criminal Court, and other police and legal organizations. The European Police Office (Europol) was created to promote cooperation amongst law enforcement agencies in the European Union (EU) when policing serious international crimes (Deflem 2010; Deflem and McDonough 2010). In 1992, the formation of Europol was outlined in the Treaty on the European Union (also known as the ‘Maastricht Treaty’) in Maastricht, The Netherlands. Europol's operations are limited to organized crime activities, including drug, human, and vehicle trafficking, cybercrimes, corruption, and terrorism, when involving two or more member nations of the EU. Importantly, Europol is overseen by the EU Council, the European Management Board, and a joint supervisory board. Nonetheless, despite being mandated by the EU and overseen by regulatory bodies, Europol maintains a level of bureaucratic autonomy to determine the specific means and objectives. Europol maintains a regional focus within the European Union, but political decision making through the EU framework does not always lead to smooth cooperation amongst law enforcement agencies. As is the case globally (amongst Interpol's member agencies), political-ideological conflicts amongst member nations still occasionally hamper cooperation. Globalization has brought about a myriad of changes in society, including the internationalization of crime. New communication and transportation technologies have led to an increase in international crime as well as new forms of crime such as cyber crimes (Deflem and McDonough 2010). Some of the specific areas of concern include border control, illegal immigration, drug trafficking, international money laundering, and international terrorism. Border control is a special focus of international law enforcement due to concerns over international crimes such as smuggling and illegal immigration. The international drug trade is another major focus of international law enforcement efforts amongst many nations across the world. Over the past two decades, there is no doubt that terrorism has become the central catalyst for greater international law enforcement. In the aftermath of the events of September 11, 2001, the focus of international law enforcement on terrorism has increased tremendously (Bayer 2010; Deflem 2010). The reorganization of policing after 9/11 is reminiscent of past attempts to politicize police in times of social turmoil. However, due to the bureaucratic autonomy attained by law enforcement organizations today, law enforcement agencies have also been able to resist these politicization efforts, addressing terrorism in its criminal components. The focus on international terrorism after 9/11 has especially served to further increase the centrality of US law enforcement institutions in international activities. The increasing concern over terrorism has led to greater powers for law enforcement agencies in terms of means of policing, equipment, personnel, and budget, as well as realignment of the police with the military. In the US, the Patriot Act (Providing Appropriate Tools Required to Intercept and Obstruct Terrorism) of 2001 expanded law enforcement powers regarding foreign suspects and terrorist organizations. The US government responded to the 9/11 attacks with a mishmash of policies and organizations adopted to address the increased concern over international terrorism (Deflem 2010). In responding to the attacks, the US government placed a premium on the military and intelligence communities in counter-terrorism efforts. The definition of the struggle against terrorism as a “war” suggests a continuing reliance on military force. However, there are several drawbacks to the near-exclusive reliance on the military and intelligence organizations to combat terrorism (Bayer 2010). The intelligence community, while a powerful tool through signal, clandestine, and extra-legal capabilities, does not have a firm foundation for mainstream international cooperation due to traditional perceptions and practices of intelligence collection, deception, and espionage activities. For this reason, the FBI's reconfiguration as a full-fledged intelligence agency and realignment with the intelligence community has complicated international police cooperation, particularly amongst countries where separations or traditional rivalries exist between intelligence and law enforcement elements. Likewise, the military approach is not universally optimal since the military is trained to confront other militaries and armed insurgencies, but not nonstate, widely dispersed, quasi-criminal networks, such as al-Qaeda, or small, individual terrorist support cells operating in big cities. As a result of the overreliance on these approaches despite their shortcomings, the potentially significant contribution of law enforcement to counter-terrorism has been greatly underutilized. There are several benefits of a counter-terrorism approach incorporating the informal networks of law enforcement organizations (Bayer 2010). As a source of information, law enforcement officials and agencies represent an enormous, untapped resource, considering their sheer numbers, representation in every part of the globe, greater local knowledge, tendency to collect information proactively, and capability to recognize suspicious activity. Law enforcement agencies also have a greater basis for international cooperation due to their common professional culture, which contains an implicit trust in other law enforcement organizations as well as a feeling of unity in the common goal of fighting crime. Law enforcement cooperation has the additional benefit of being able to engage in cooperation informally, which is not to be confused with illegality or extra-legality. Informal means of cooperation are frequently used, and are faster and more efficient than formal bureaucratic methods (Swallow 1993; Bayer 2010). This efficiency is especially important when speed is necessary to act on information and when formal cooperation would hinder an investigation or operation. As a counter-terrorism tool, international law enforcement has several advantages that could complement the military and intelligence approach (Bayer 2010). In contrast to the intelligence community, law enforcement has a greater basis for cooperation, and is perceived as less political and more trustworthy. Furthermore, police agencies represent a greater source of information given their sheer numbers and respective knowledge of local information. Existing networks of international law enforcement can mitigate, match, and exceed the network advantages of criminal and terrorist organizations alike. While militaries are ill-suited to combat such criminal terrorist networks, law enforcement agencies, in contrast, represent an extant network sharing a common culture and mission that can more efficiently combat terrorist networks such as al-Qaeda. Despite the benefits of engaging informal international networks of law enforcement in counter-terrorism efforts, several obstacles exist which encumber this strategy (Bayer 2010). Organizationally, competition amongst rival instruments of national power (such as intelligence and law enforcement) vying for funding and prestige has led to the development of turf wars between government agencies. These turf wars further restrict cooperation amongst bureaucratic structures already resistant to change and innovation. Procedurally, there exists overuse and abuse of the information classification system, which can facilitate bureaucratic consolidation of power through information control. Such maneuvering obstructs the sharing of information necessary to confront terrorism effectively. But law enforcement can serve as an important counterbalance to the effective but politically malleable intelligence function because police agencies already share the notion of terrorism as a crime as a common mission. As this article shows, international law enforcement has developed through historical changes that have fostered the bureaucratic autonomy of law enforcement agencies. International law enforcement has a history tracing back to the nineteenth century, and has over the years continued to grow in participation and capabilities. Today, multilateral organizations such as Interpol and Europol serve as the basis of cooperation and information exchange amongst law enforcement agencies of different nations. Strikingly, law enforcement cooperation can occur amongst nations with different political and legal frameworks due to the bureaucratic autonomy of law enforcement, the apolitical nature of cooperation, and the shared understanding of crime amongst professionals from the law enforcement community. As a result, crimes that cross national jurisdictions, such as border crimes, the drug trade, and international terrorism, can be effectively addressed through the cooperation of law enforcement. Law enforcement agencies around the world are a vast resource in responding to international crimes. In the coming years and decades, it can safely be assumed that globalization processes will continue to necessitate international law enforcement activities. Anderson, M. (1997). Interpol and the developing system of international police cooperation, in Crime and law enforcement in the global village, ed. William F. McDonald, 89-102. Cincinnati, OH: Anderson. Bayer, M.D. (2005). Operation global pursuit: in pursuit of the world’s most dangerous fugitives and terrorists. The Police Chief 72(8), 32-37. Bayer, M.D. (2010). The Blue Planet: Informal international police networks and national intelligence. Washington, DC: NDIC press. Deflem, M. (2002). Policing world society: Historical foundations of international police cooperation. Oxford: Oxford University Press. Deflem, M. (2005) International police cooperation – history of. In R. A. Wright & J. M. Miller (eds. ), The Encyclopedia of Criminology. New York: Routledge, pp. 795–798. Deflem, M. (2009). Interpol, in The Sage dictionary of policing, ed. Alison Wakefield and Jenny Fleming, 179-81. London: Sage Publications. Deflem, M. (2010). The policing of terrorism. New York: Routledge. Deflem, M. and S. McDonough. (2010). International law enforcement organizations, in Comparative and international policing, justice, and transnational crime, ed. Sesha Kethineni, 127-148. Durham, NC: Carolina Academic Press. Nadelmann, E.A. (1993). Cops across borders: The internationalization of U.S. criminal law enforcement. University Park: Pennsylvania State University Press. Swallow, P.S. (1993) European Police Cooperation: A Comparative Analysis of European Level Institutional and Organisational Developments and National Level Policies and Structures, PhD, University of Southampton. Andreas, P. and E. Nadelmann. (2006). Policing the globe. New York: Oxford University Press. Casey, J. (2010). Policing the world: The practice of international and transnational policing. Durham, NC: Carolina Academic Press. Das, D.K. and P.C. Kratcoski, eds. (2003). Meeting the challenges of global terrorism: prevention, control, and recovery. Lanham, MD: Lexington Books. Deflem, M. (2004). Social control and the policing of terrorism: Foundations for a sociology of counter-terrorism. American Sociologist 35(2), 75-92. Deflem, M. (2006). Global rule of law or global rule of law enforcement? International police cooperation and counter-terrorism. Annals of the American Academy of Political Science 603, 240-52. Friedrichs, J. 2008. Fighting terrorism and drugs: Europe and international police cooperation. New York: Routledge. Greener, B.K. (2009). The new international policing. Basingstoke, UK: Palgrave Macmillan. Liang, H.H. (1992). The rise of the modern police and the European state system from Metternich to the Second World War. New York: Cambridge University Press. Martha, R.S.J. (2010). The Legal Foundations of Interpol. Oxford, UK: Hart. Perito, R.M. (2002). The American experience with police in peace operations. Clementsport, Canada: The Canadian Peacekeeping Press. See also: Counter-Terrorism; Drug Trafficking; Europol; Globalization and Crime; Interpol; Terrorism, International. Mathieu Deflem is Professor of Sociology at the University of South Carolina. His main areas of expertise are sociology of law, international policing, counter-terrorism, social theory, and popular culture. He has published dozens of articles, edited seven books, and authored three books, including Policing World Society (2002) and The Policing of Terrorism (2010). Michael D. Bayer is a regional agent-in-charge of a prominent, internationally oriented U.S. federal law enforcement agency. A former chief of a transnational criminal investigative section, he has also served in leadership positions at American embassies overseas, as a criminal investigator, and as a protective security officer for numerous foreign dignitaries and high level U.S. government officials. He holds bachelor’s and master’s degrees from Duquesne University, and is presently pursuing a Ph.D. from the University of Wollongong, Australia.